In 2008 Transfield Holdings augmented the cultural landscape of the Walsh Bay precinct with the launch of the Walsh Bay Sculpture Walk, an outdoor exhibition of works from The Transfield Art Collection and through loans from artists and private patrons. The Walsh Bay Sculpture Walk is a vibrant outdoor exhibition of sculptures located around Walsh Bay just west of the Sydney Harbour Bridge. There are currently seven sculpture works located throughout the precinct. Some can be found near or along the broad sweep of Hickson Road, which curves behind the five finger wharves of Walsh Bay, while others can be found on the wharves themselves. 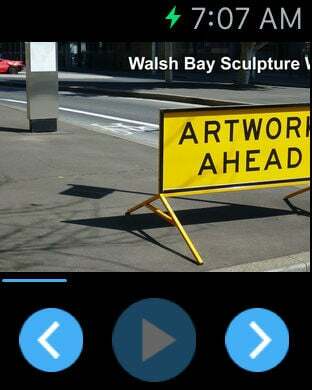 Accessible Arts, in partnership with the Transfield Foundation, developed this audio-described tour of the Walsh Bay Sculpture Walk. The Audio Tour aligns with the Transfield Foundation’s commitment to supporting ground-braking arts organisations. The Audio Tour is a creative and organic expansion of the Sculpture Walk, increasing access to, and engagement with, the Transfield Sculpture collection. Finaly the Audio Tour provides an educational resource for artists, art students and appreciators of art, as each sculpture provides an informed description co-written by curators and artists in collaboration with the Accessible Arts team.